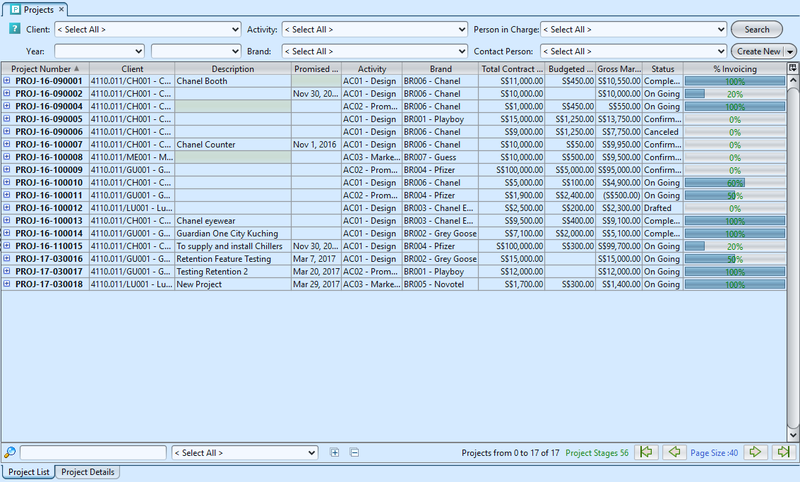 Projects application allows user to create and manage projects, and to define activities and specifications for CRM and SCM. It is the center of project management. From this application, user can generate project proposals to send to customers, issue invoices, issue delivery order, create purchase orders, and generate purchase voucher (invoice) for payment to vendors. 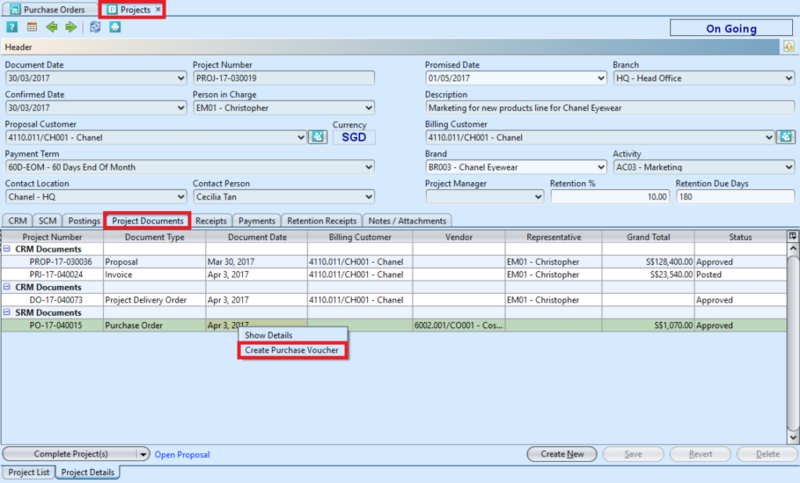 User also able to define retention terms for the project and track retention claim invoices. As on cut off dates, quarter closing or year closing, user may need to realize part of project. Accounts user can realize the project using this application. Before realizing, ensure that the invoices are raised and confirmed. When all project’s services are delivered and invoiced, user will then need to close / complete the project document. Project Documents tab: list of documents related to the project, e.g. quotations, delivery order, purchase orders, invoices, retention claim invoices, etc. 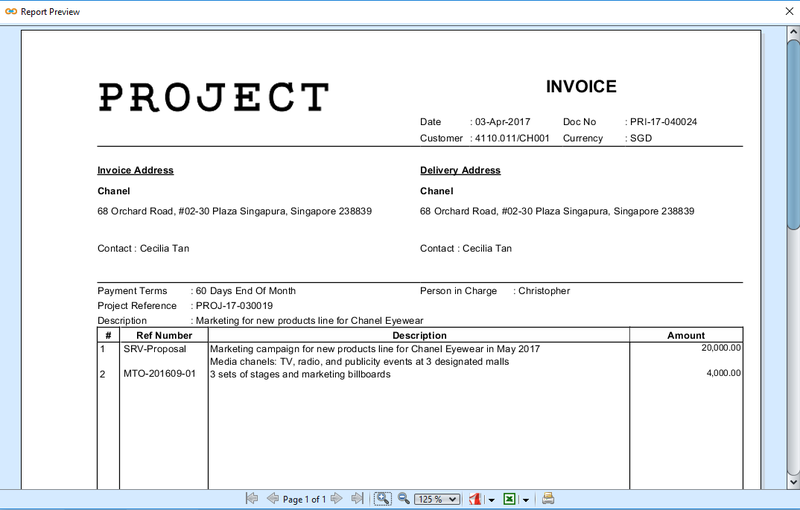 Receipts tab: list of customer receipts related to the project. Payments tab: list of vendors’ payments related to the project. Retention Receipts tab: list of retention receipts related to the project. Notes / Attachments tab: documents received from clients and other project related documents which are not issued by the system or received by third party can be uploaded using this tab. 3. Fill up project’s information on the top half of screen. Enter Retention % value and Retention Due Days (if any), are as per agreed with the customer over the project. 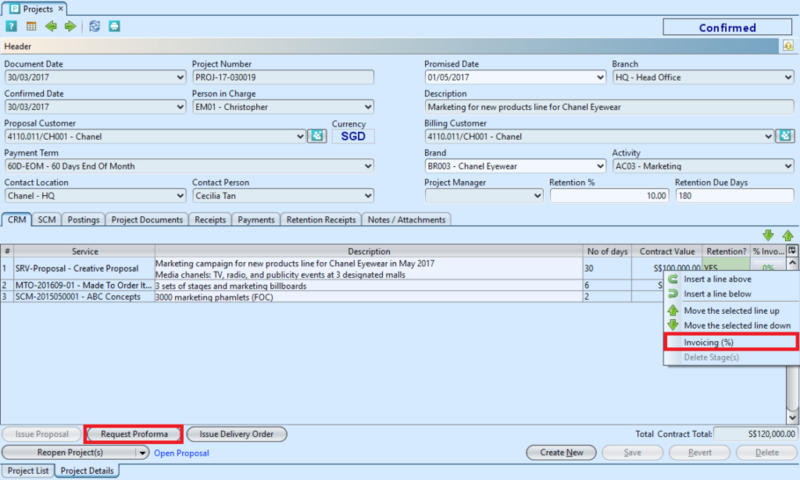 If a delivery order document need to be issued for item delivery to the customer, use “Made To Order Item” type of service (product) in the “CRM” tab. 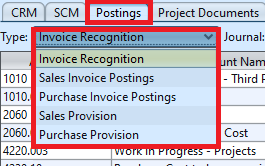 User will be able to Issue Delivery Order document (only) for “Made To Order Item” type line item in the “CRM” tab, when Project document status is Confirmed / On Going. If an Item / Article type of service (product) is entered in the “CRM” tab, system will generate an expense line item pair for it in the “SCM” tab, of which user can use to enter cost for it, if any. 6. 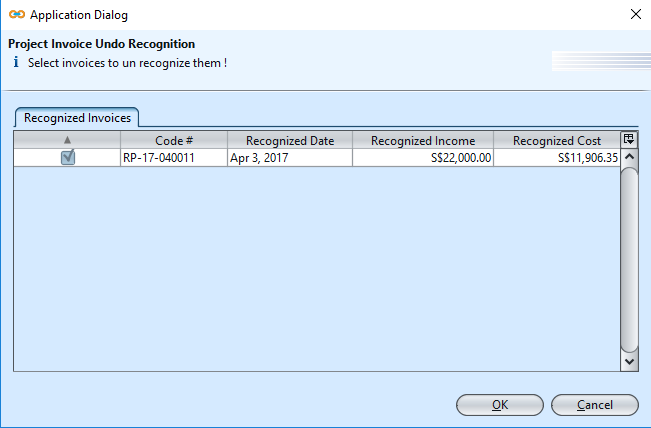 Enter the revenue service’s info* and click button to add the service into the project document. For free of charge (FOC) service, enter “Contract Value” = 0. Select “Yes” if the service line was assigned for retention of service. 8. 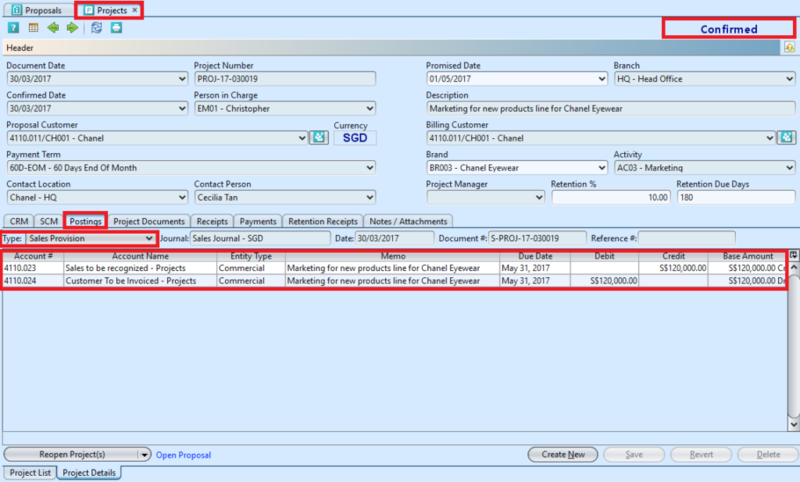 If there is any expense for the project, add a vendor’s service into the SCM section by searching for the vendor and service from the “Vendor” and “Service” drop-down lists in the table on “SCM” tab. *Note: Vendor is an optional field, this allow user to enter company’s internal cost (i.e. manpower) as part of the project’s costing, without the need to create any purchase order for these. 9. 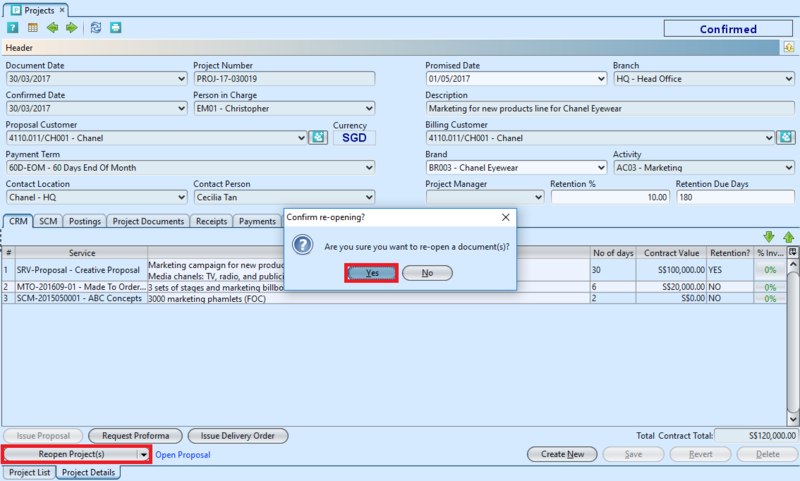 Enter the expense service’s info* and click button to add the vendor’s service into the project document. 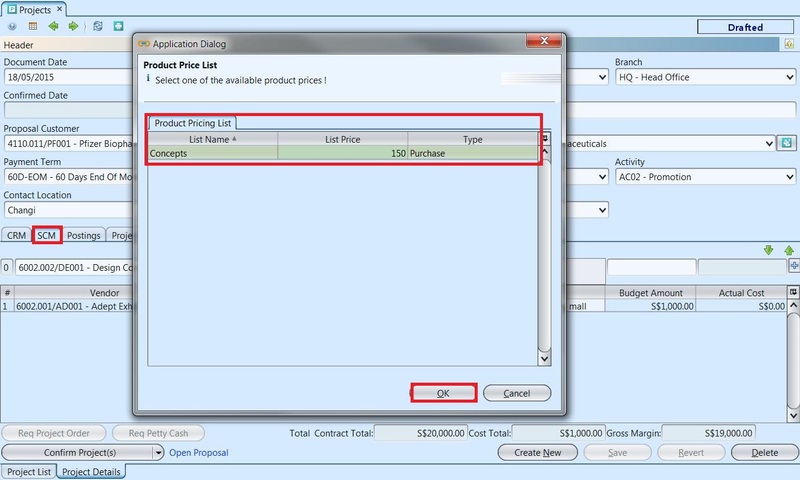 If purchase price is listed in the system for a vendor’s service or product, it will pop up “Product Price List” window for user to select the list price as the budget amount. 13. Click on “Issue Proposal” button at the bottom of screen to issue project proposal of the project document for the customer to review and accept. It will generate proposal document and open the document for user to review. 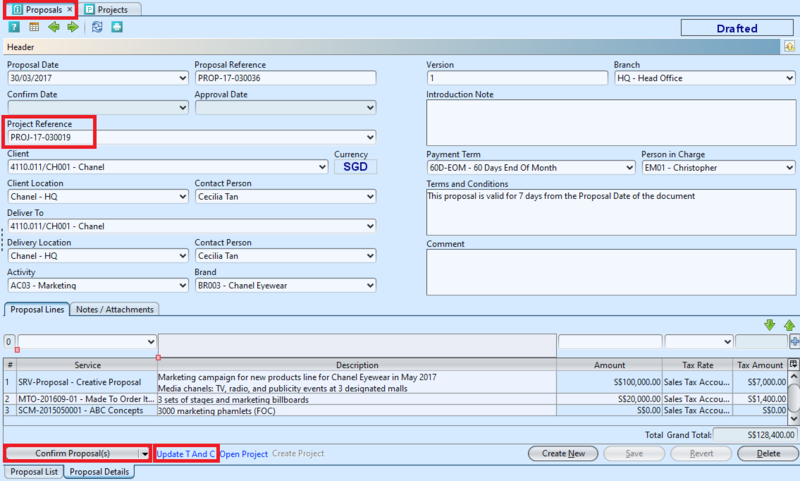 User can click on “Open Proposal” link at the bottom of screen to view the proposal document details. 16. 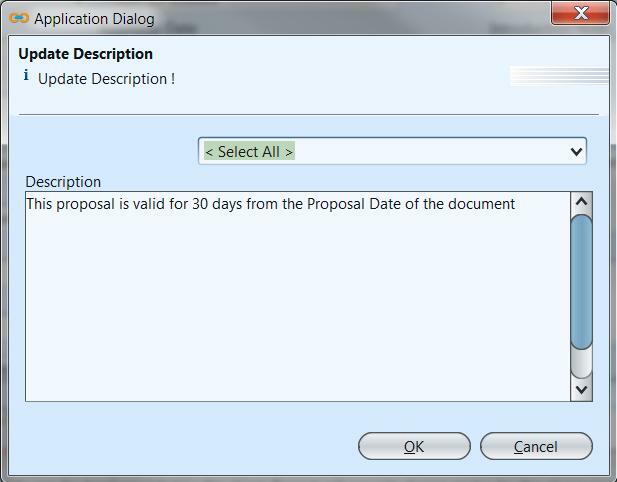 On “Proposal Details” tab, click on “Approve Proposal(s)” button at the bottom of screen, AFTER customer have accepted the project proposal, to approve the project proposal document. This will confirm the project document status. User can click on the “Open Project” link at the bottom of screen to view the confirmed project document. 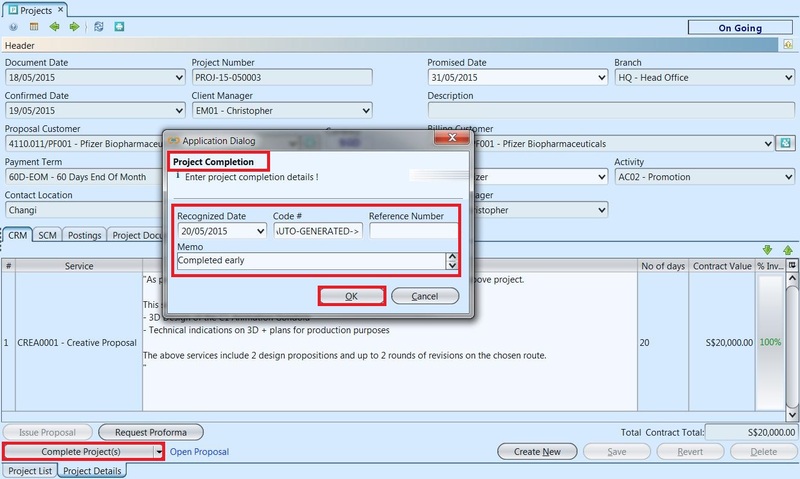 Only “Promised Date” can be change by user after project confirmation. 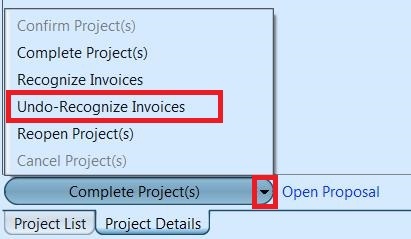 On the project document, user can view list of documents that have been created relating to the project under “Project Documents” tab. Right click on a document to view the details. 2. 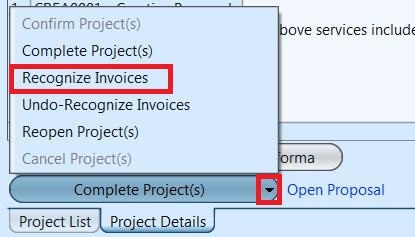 Double click on project document to be updated, it will bring up the details on “Project Details” tab for the selected document. 6. 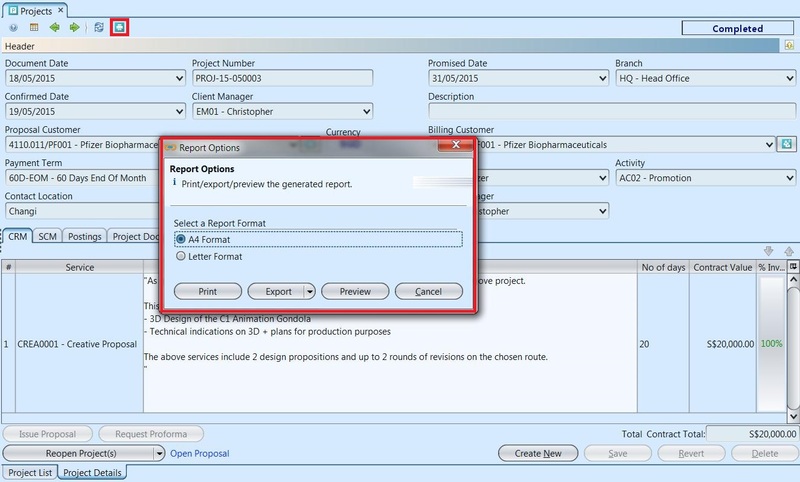 Click on “Issue Proposal” button at the bottom of screen to issue project proposal of the project document for the customer to review and accept. 8. 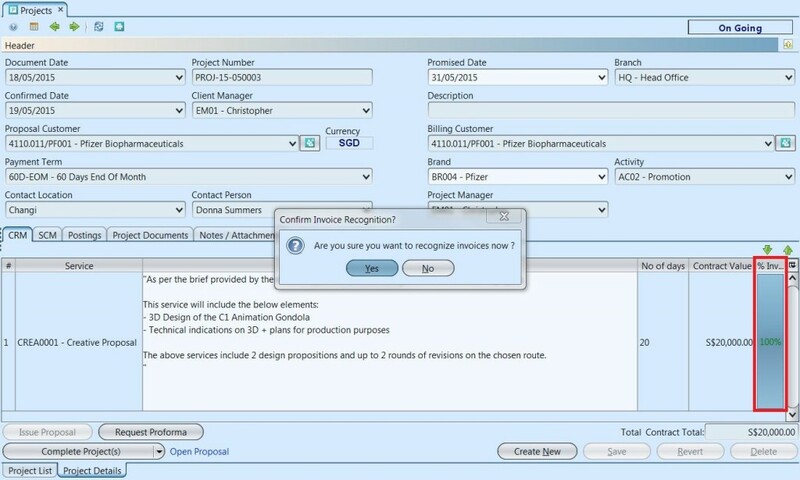 On “Proposal Details” tab, click on “Approve Proposal” button at the bottom of screen, AFTER customer have accepted the project proposal, to approve the project proposal document. This will confirm the project document status. 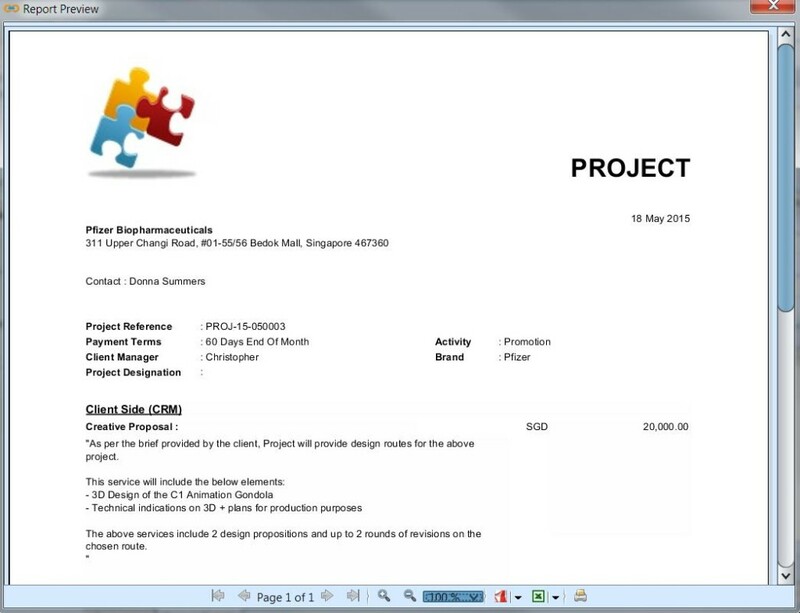 User can click on the “Open Project” link at the bottom of screen to view the confirmed project document. 2. 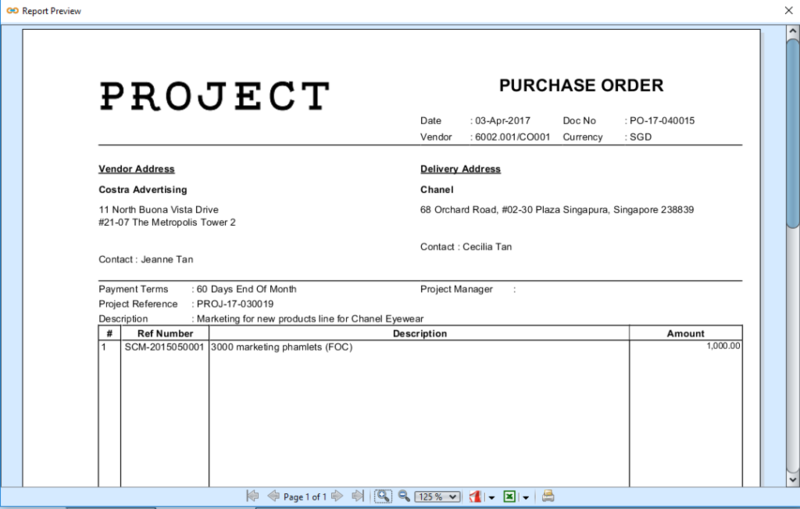 Double click on project document to be view, it will bring up the details on “Project Details” tab for the selected document. 3. 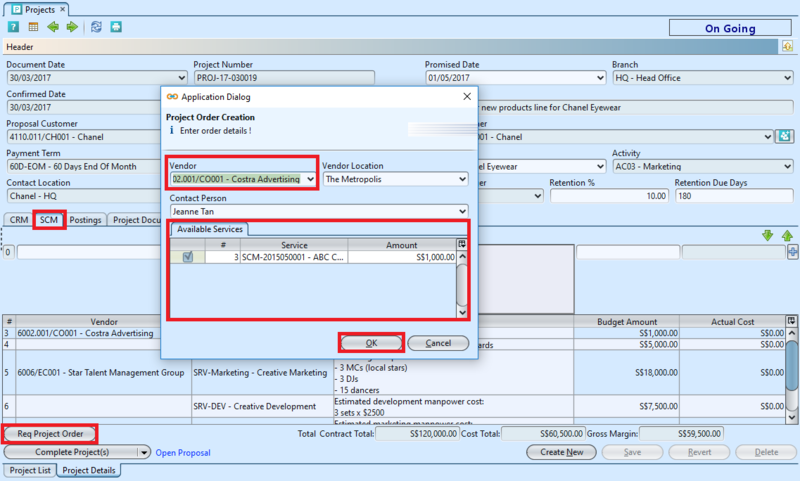 On “CRM” tab, right-click on a service to assign % of contract value to invoice, a pop up window will show options, choose “Invoicing (%)” option and enter the new invoice *value in percentage of the contract value. 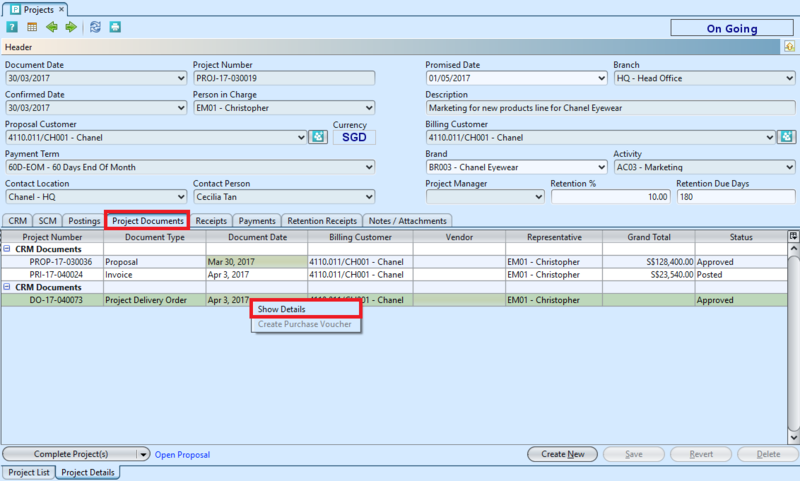 User may select multiple CRM service lines to invoice them in the same document, by holding “CTRL” button while selecting the lines. Invoice progress start at 0%. “New Invoice (%)” value is accumulative. For example, if you need to first charge 20% down payment, enter 20%. Afterwards, if you need to invoice another 30%, enter 50% (20% + 30%). 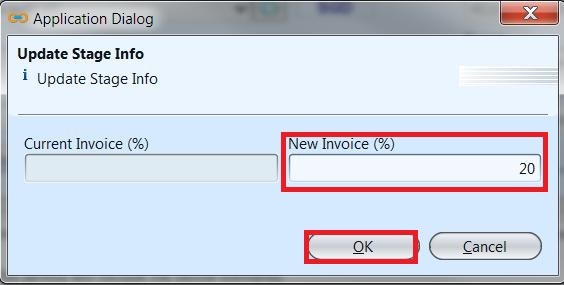 The last invoice for the service is the full amount, so enter 100% as “New Invoice (%)” value. If discount is added to a project and proposal with a separate line mentioning the negative value, e.g. 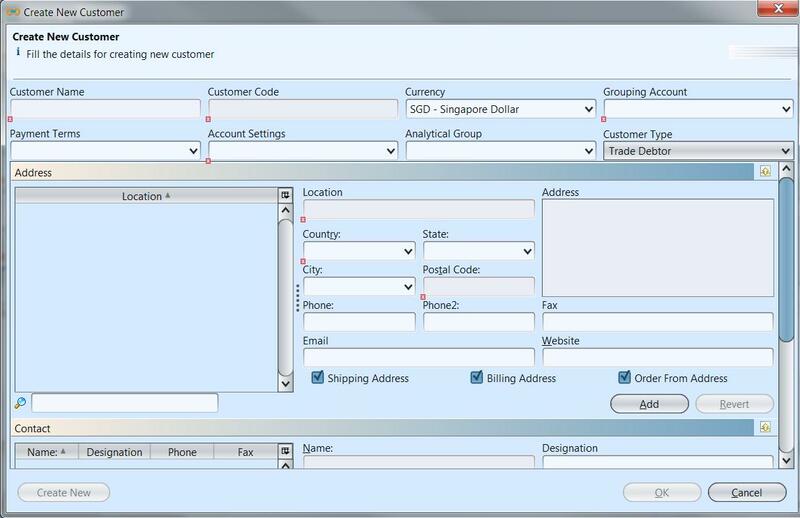 (SGD 2000), at the time of requesting invoice, invoicing % value to be allocated to that discount should be the same invoicing % value as given for invoicing. 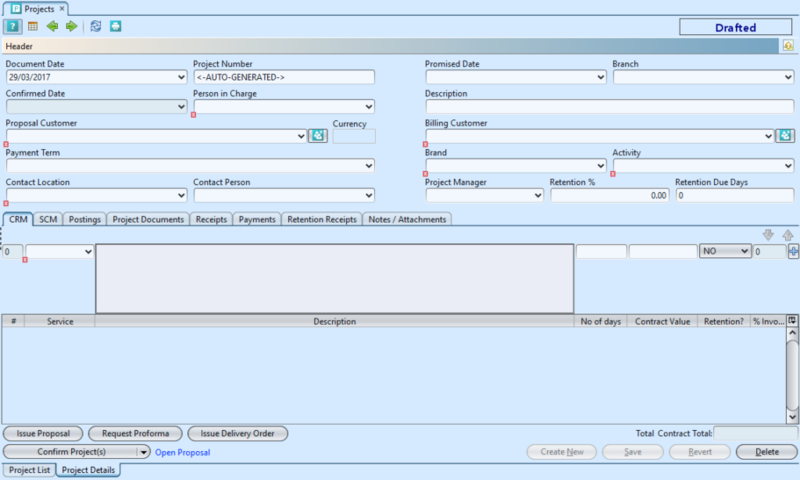 It will automatically allocate the discount to the invoice with its %. If there are any FOC (free of charge) service, user does not need to allocate any invoicing % as this shall not be reflected in invoices, this is only for the purpose of mentioning the FOC service in the proposal. 8. 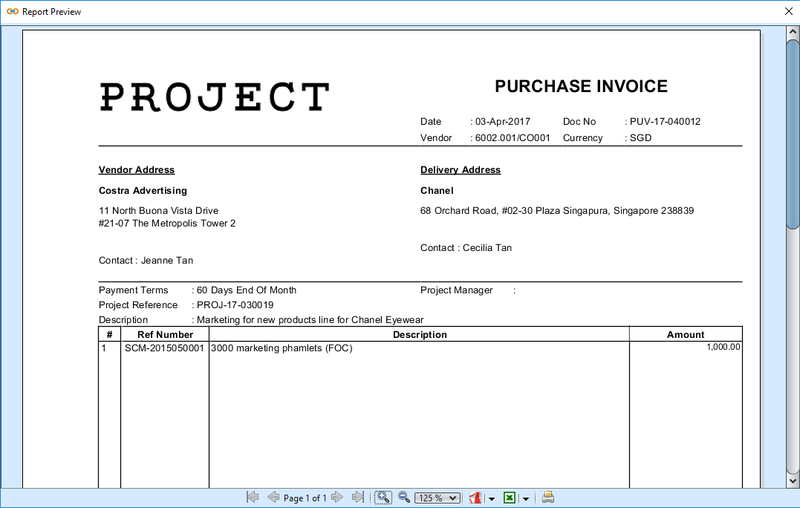 On “Invoices Details” tab, user can click on the “Open Project” link at the bottom of screen to view the project document. 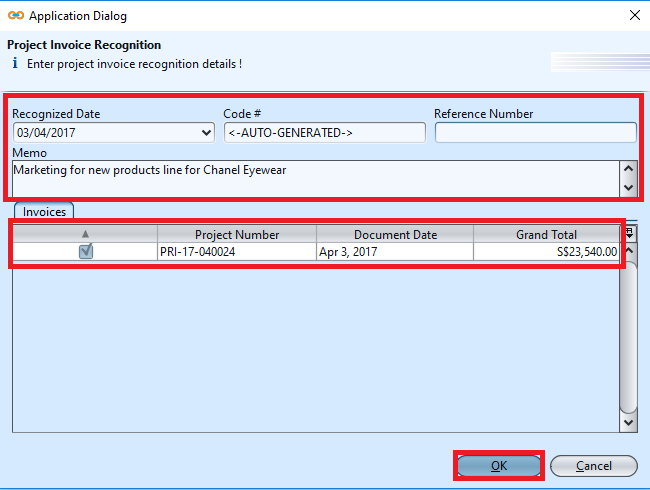 Note: User will be able to Issue Delivery Order document (only) for “Made To Order Item” type line item in the “CRM” tab, when Project document status is Confirmed / On Going. 3. 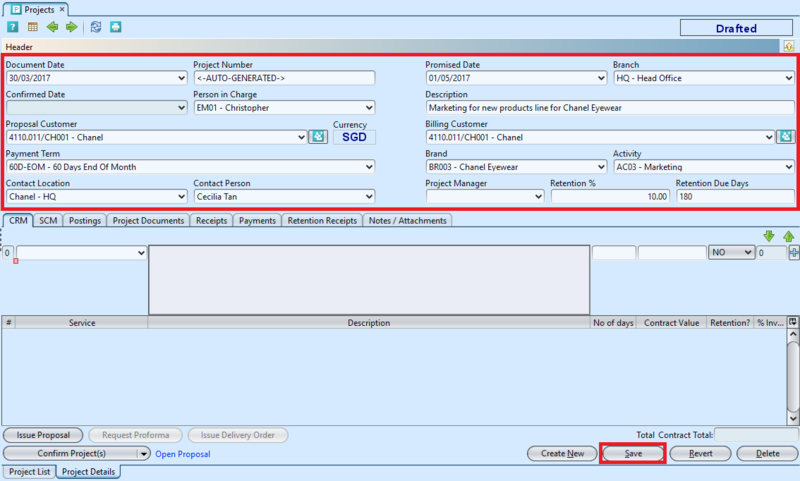 On “CRM” tab, click “Issue Delivery Order” button, it will generate Delivery Order document with Made To Order line items. 4. Confirm and Approve the the Delivery Order document. 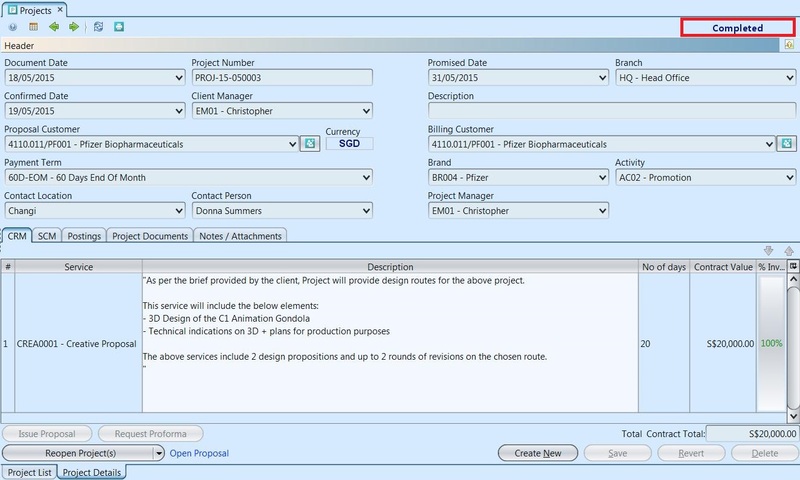 When all project’s services “Invoicing %” values are all 100% (for non FOC services), user will need to close / complete the project.